The new year is a few days old as I post this, and I feel it is quite descriptive of how my blogging has been the last year. I can only hope that in 2016 I will be better at posting consistently and more on time. Today’s photo is a somewhat rare photo from me, as it is taken with my mobile, and I have not even seen it on a pc screen yet. I took all my fireworks photos on New Year’s Eve with my new Samsung Galaxy S6. 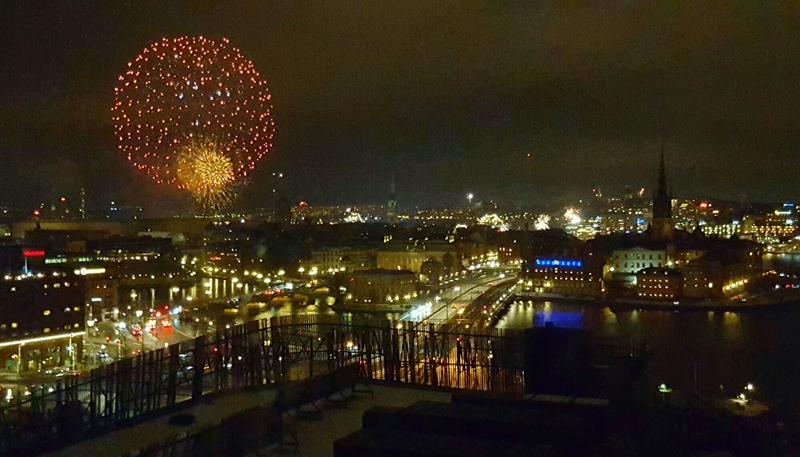 It is taken from the 16th floor of the Radisson Blue Waterfront hotel in Stockholm, where we enjoyed a wonderful view of the fireworks. One of my photographic goals for this year is to take more pictures with my mobile. I have a better one than ever before, and I always have it with me, so I’ll try to use it more. My other goal is to get better at taking the time to get out to take pictures when the light and circumstances are right. I will also try to be more active both on Instagram and here on the blog, and hopefully gain many more followers.